Dr Michael Flynn / News / I’m Pregnant. Now What? 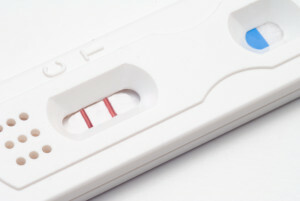 A Home Pregnancy Test showing a positive result. Your first step is seeing your GP and confirming your pregnancy, and getting a referral to your new support team – your Obstetrician. Your Obstetrician will be your guide on your pregnancy journey, answer your questions, monitor both yours and the baby’s health and development, provide advice specific to your needs and finally, ensure the safe delivery of your baby. Dr Michael Flynn explains what to expect at an Obstetric appointment. “At the first visit, we will spend approximately an hour planning and explaining all the new and exciting options to do with your pregnancy.” Dr Allanach or I personally review every couple at the first visit, perform an ultrasound and take a thorough history to highlight any options that may be required in pregnancy. All the tests are fully explained and organised. It’s important when selecting a specialist, to make sure they take the time to explain the organisation and costings and that you get a list of all fees that could possibly occur. Check if pathology is bulk-billed and if you have to make time to drive to a different location for each test, are there extra charges if an emergency Caesarean is required, who will be doing your scans and do they specialise in pregnancy scans and, the most important question, who will be delivering your baby? Your Obstetrician should provide all of this information at the first appointment, ensuring there are no nasty surprises later. The most important factor to keep in mind when selecting your support team for your pregnancy is quality and outcome. Dr Claire Allanach and Dr Michael Flynn both have extensive experience in the highest level of pregnancy care and delivery. Appointments can be made by phoning our office on (07) 5564 8011 or here.